On my not infrequent trips across the Irish Sea, I have always found it very easy to find (or almost impossible to avoid, depending on your viewpoint) music sessions. The same is certainly not true of singing. Over the past few years, a number of singing circles have been started to encourage ordinary members of the community to sing in public and to keep alive the local singing tradition, perhaps most notably by Jimmy McBride in Inishowen. I have been pleased to be present at meetings of the singing circles in Nenagh and South Roscommon and have always been impressed not just by the quality but the breadth of material on offer there. Both of these groups have now issued their own CDs which are well worth tracking down, especially by any singer looking for new material. 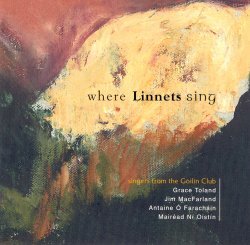 The Góilín Traditional Singers’ Club, which meets in Dublin each Friday from September to the weekend before the Willie Clancy Summer School predates these singing circles - having recently celebrated 20 years of singing sessions - and, partly to celebrate the event, they too have put out their own CD. This features songs in both English and Irish with four singers each contributing four songs. The one singer I had not heard in person is Jim McFarland. Originally from Derry, but now living in Co Meath, he has a singing style which is unmistakenly Northern. His first song, One Morning in May, is delivered in a highly decorated style which is not entirely to my liking, although it has rather grown on me with repeated listening. It was with some trepidation then that I waited for his next offering. For me there are some performances that are as near perfect as to render other interpretations superfluous. One such is Paddy Tunney’s singing of The Mountain Streams Where the Moorcocks Crow. Still, Jim carries it off well enough, and even better is to come with Willie Ward, a lively and light hearted song celebrating the feats of a local cobbler, which suits his voice and style very well. Antaine Ó Farachain is a big man with a voice to match. I remember hearing him singing at Sidmouth some years ago and he contributed three songs to the 1999 CD Seachran Si (CICD135) including a monumental rendering of Bean an tSeanduine. His singing here, I felt rather more restrained than I remember from hearing him live. Although from Dublin, he is much influenced by the singing style of Connemara, to my ears in particular his singing is reminiscent of Seán acDonnacha. He sings just the one song in English, The Four Seasons, a modern song with words by Antaine set to a variant of the tune I associate with Skibereen. He sounds more at ease with this than his three songs in Irish. I don’t know if this is because of the language (I regret that I do not have even rudimentary Irish, although I have never let this spoil my enjoyment of the sean-nós) or merely because the tunes are more complex. Still, I enjoyed his performances and was moved by his singing of the lament Johnny Seoghe, a song about a Relieving Office from Carna during the great famine. With so many people around the world starving, somehow even today the song is topical and relevant. In September, I was touring in West Galway during the last few days of the Community Arts Week in Clifden. Having to choose between concerts featuring musical heroes of mine (the Hernon Brothers and Johnny Connolly), I chose Johnny Connolly partly because the venue was within walking distance of my hotel and I rather expected to indulge in a drop of the black stuff. He was in wonderful form. Also on the bill at the Smugglers Roost Hotel was Mairéad Ní Oistin. She sang beautifully there and her songs on this CD show her in very fine form. I think my favourite song on the whole CD is her version of Donal Og, a song of lost love set to an achingly beautiful tune. Mairead, who now lives in Connemara, learned the song from Treasa Ni Mhaolain from Inis Mor who was also performing at the same Clifden concert. To my admittedly untrained ear, Mairead, along with Eilís Ní Shúilleabháin, is just about the finest of the younger breed of female sean-nós singers, and I hope some enterprising record company (CiC are you listening?) will soon give her a full CD of her own. The recording by Harry Bradshaw is crystal clear and the booklet notes are informative with a brief biography of each of the singers, accurate song transcriptions (certainly of the songs in English), literal translations of those in Irish and a short note about each song from the singer. Although a privately produced CD, everything about it is very professional. This is a very nice record and I can do no more than recommend it to lovers of song in English and Irish. If the sean-nós is not something you have explored before, this could be a good starting point. The singers are young and in fine voice, the songs are not over-long and they are interspersed with other songs in English. I imagine that the CD is available from the club, but if you can’t get to Dublin, it was featured in recent newsletters from both Claddagh and Veteran.